This 1932 map of New Orleans pinpoints some of the city's early landmarks, including Union Depot, the Maison Blanche department, and the St. Louis Cathedral. 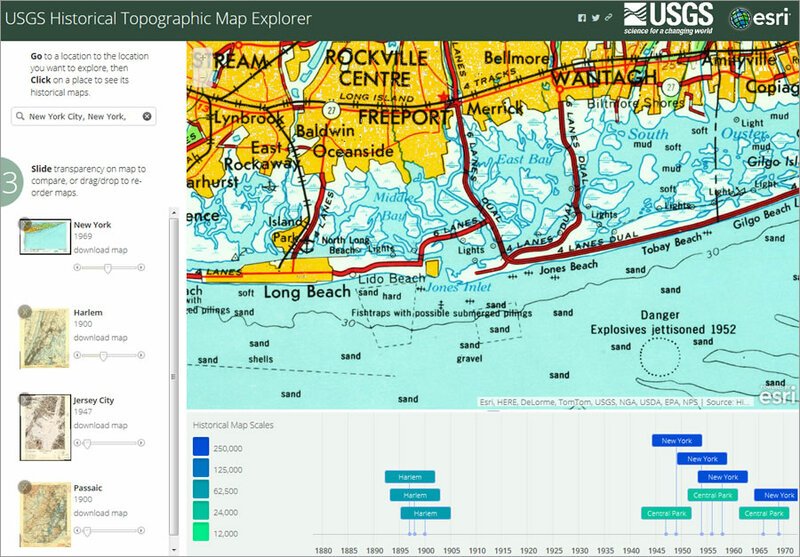 The United States Geological Survey (USGS) and Esri, two of the most authoritative mapping sources in the country, have partnered to put the rich tapestry of US historical maps into the hands of everyone. 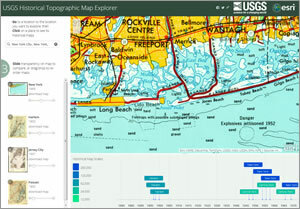 The USGS Historical Topographic Map Explorer app brings to life more than 178,000 maps dating from 1884 to 2006. USGS historical maps were once available only as printed lithographic copies. Recently, the legacy quadrangles were made available as free, downloadable GeoPDF versions as part of the USGS Historical Topographic Map Collection. 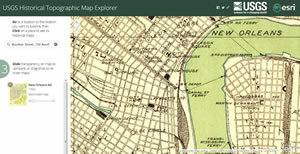 You can now use the new USGS Historical Topographic Map Explorer application to access the historical maps as high-resolution georeferenced images for use in web mapping applications. The app features a timeline to easily select desired maps. This 1969 New York map depicts some of the beach communities and at least one potentially dangerous spot offshore. "We are pleased to see these historic topographic maps being made more accessible to the nation," said Kevin Gallagher, associate director of core science systems for the USGS. "We recognize the fundamental role of government in acquiring mapping information and putting it in the public domain. At the same time, we recognize the tremendous benefits of the private industry adding value through innovative approaches to access and distribution." Go to http://historicalmaps.arcgis.com/usgs/ (no need for a download from an app store). Search for the place of your choice, then click on the map. Move the slider bar to see the changes over time. You also can drag and drop maps and compare them side by side. Save a copy of the maps on your desktop. Hollywood in the 1950s, when actors such as Marlon Brando and Marilyn Monroe were popular stars. The app will soon be available in GitHub, allowing users in the GIS community to create their own scanned and georeferenced collection, configure the app, and see these digital collections come to life. "We are pleased to partner with the USGS on this app to bring this national treasure to life," said Jack Dangermond, Esri president. "This application provides an easy way for anyone to explore the historic map collection by both place and time. 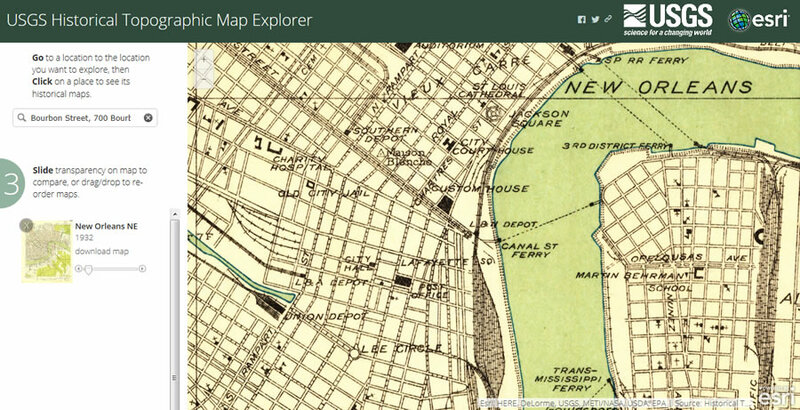 The ArcGIS platform supports the building and sharing of amazing maps and content such as this wonderful collection." The collection includes such maps as New Orleans, Louisiana, in 1932. You can use a transparency slider to compare that map to a current one to see which landmarks have been lost to time, such as the Maison Blanche department store, which was founded in 1897. Likewise, a 1954 map of Hollywood shows landmarks that have since disappeared, including NBC's Radio City.